A very handy size for micro layouts is the metric A3 paper sheet, which is 297×420 mm, or about 11.7″x16.5″. Just open out any A4-sized magazine, and you’ll see an A3 sheet. There have been several competitions for layout design in this size, with more on the way. So herewith, a selection of A3-sized micro designs – beginning with a pair of Gn15 layouts (1:24, or 1/2″ = 1′). If it can be done in that scale, any smaller scale should be easy! Your contributions are invited. Jack Trollope recognized the limitations of the A3 size on Gn15 rolling stock maneuvers. He designed around this issue by creating an intra-works industrial tram line at the Avery-Labelle Manufacturing Co.
Central to the layout’s operation is a six-inch diameter turntable that accesses nearly all the trackage on the baseboard. Behind the scenes, an unconventional traverser slides back and forth, conveying rolling stock from the hidden siding to the Works gate that provides entry to the layout. The turntable will hold a small two-axle switching locomotive and a single four-wheel wagon. Considering that Gn15 is a scale of 1/2″ = 1′, this tiny A3 sized baseboard is an intensely busy place! Obviously, the same plan works even better in On30 / O-16.5 scale. Taking the theme of an intra-works tramway railroad to a further extreme, here is the AAA Molasses Works, a two-level Gn15 industrial line that brings molasses from the mine to the processing plant, distributes materials within the works, and delivers the finished product in jars or barrels to the Interchange track for shipment to the outside world. In this case, the Works building occupies nearly the entire baseboard, and tracks weave in and out of it in complex ways, much like a variety of real-life industries. It was E.L. Moore, the Structure Sage from North Carolina, who first discovered that molasses is actually a mineral that is dug out in mines and smelted down to form the viscous liquid that we all love (Railroad Model Craftsman, February 1969). The AAA Works is based on Mr. Moore’s epochal discovery, but writ large. For the mechanically inclined, there’s a lot of activity here — a hidden turntable inside the building, used to distribute cars to a variety of destinations; a train elevator that llifts cars and locomotives from the ground floor up to the first floor, where processing begins; a working wagon tip, where the molasses ore incoming from the mine at the upper left (off the baseboard) is poured into waiting works wagons on the track below; and an animated interchange track where the outgoing products are shifted from the intra-works tram to standard gauge wagons for shipment to the eagerly waiting world of commerce. If you trace out the traffic patterns available on this small hunk of real estate, you’ll be amazed at the variety of operations that can be performed on this little layout! I would recommend that the rear of the building be left open for access from behind by the operators, creating a broad range of “fiddle” possibilities to further enlarge the gamut of operating possibilities. As an A3 sheet size is just two A4 sheets placed side by side, astute model rails have observed that one can also place two A4 sheets end to end and still cover an area exactly equivalent to an A3 sheet. This geometry can be a basis for interesting micro layouts. 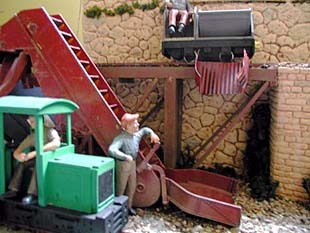 “Kelso Creek represents a tiny section of a quarry, with small flat wagons on the high level incline moving large chunks of rock from the rockface to the grinder (offscene). Terry will be exhibiting this ingenious layout in a few months. We hope to bring you progress photos as construction proceeds. Addendum: As promised above, here are two work-in-progress photos of the Kelso Creek Quarrying Co. construction. Although some detailing still remained to be done, Terry had basically finished the layout by March 2003, when these shots were taken. Also designed for two A4 sheets laid end to end is Jack Trollope’s Tramways de Chamiex-Les Thurs. This active little tramway is designed around a batch of converted Gnomy carriages (similar to the pair by Terry Allen shown at right). The modeled Tramways platform is a busy place! First, a green tram appears under the archway (lower left), runs into the lower platform, stops and waits. A second tram, this one red, appears in the archway, runs to the upper platform and waits. The green tram returns to the building with the archway, and then the red tram runs off into the woods, looking for greener pastures. These shenanigans can continue ad infinitum, with a rainbow of trams appearing under the archway, put in play by the busy hand of the operator. Occasionally a tram locomotive, also a converted Gnomy car like number 2 in the photo, can appear pulling a very small wagon or van, then pause at the platform to be unloaded. But the main event is a never-ending parade of multi-hued Gnomy carriage conversions (placed on SPUD power trucks). The layout is nominally On30 / O16.5, but can also be built in 1/32 or 1/35 scales, for which the Gnomy material also makes an excellent conversion. The layout measures 8.25″x23.4″ (210×594 mm). I’m often asked, “What is the smallest possible Inglenook layout?” There are actually two questions here. Here’s one approach to answering both questions–the A3 Sized Inglenook. A lot of experimenting has convinced me that the canonical Inglenook size of 5-3-3 car sidings can be reduced and still have interesting switching. The smallest that I think practical is 3-2-2 car sidings, with a 3-car (or 2 cars + Locomotive) lead track (head shunt). Here’s the resulting track plan, which fits comfortably in an A3 sheet size (297×420 mm or 16.5″x11.7″). 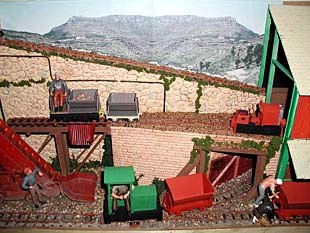 It’s designed to resemble a conventional quarry-face mining railroad, and even includes a loco storage and repair shed. The switching puzzle would involve assembling a designated four-car train from a random assortment of six cars scattered among the sidings. The layout can be bult in either Gn15 or On30 / On18. The price you pay for squeezing these large scales into this small space is 6″ radius curves and handlaid track, with four-wheel cars (wagons) and tiny four-wheel “critters” for motive power. I suggest using stub switches, which require less room and are virtually foolproof in this kind of track arrangement. Building it in the very-small scales — HO, N, and Z — would require significantly less space. As always, car-capacity of the sidings will determine the over-all dimensions. For more information about Inglenook switching problems, see the Inglenook section of this Gallery or consult The Model Railways Shunting Puzzles Website. Accomplishing interesting operation with very simple means is the goal of Jon Songøygard, from Norway. 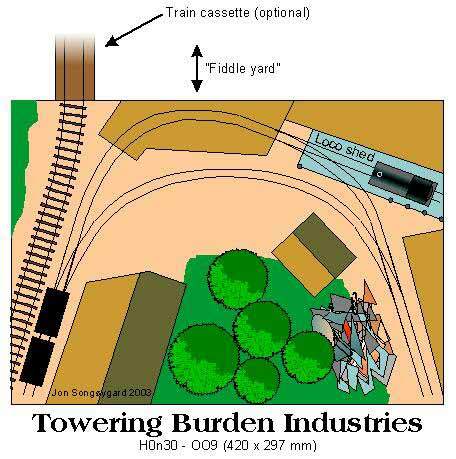 Towering Burden Industries fits an HOn30 railroad on an A3 sheet (16.5″x11.7″) and offers interesting switching with a simple passing siding (runaround loop). “Traffic goes from the factory at right, via the department on top, to the normal (standard) gauge track at left (with a storage shed next to it), and back. There’s also a runaround track for the operator. At the top department you can fiddle cars, so the tracks there actually suggest the entrance to a bigger yard. “With the addition of a normal gauge train cassette on top, one could even change the normal gauge setup during an operation session. This would then be the real connection to the ‘outside world’. Built in On30 or O16.5, this little layout would occupy only about 24″x18″ (60×45 cm). Towering Burden Industries manages to squeeze in a lot of operations using a very simple track plan in a minimum of space! Ian Bareham’s entry in a recent competition for layouts built to fit on an A3-sized baseboard (or two A4 sized sheets placed end to end) was this attractive display, St. Augustine’s Hospital Railway. The freelanced hospital is set in the eastern side of Ipswich, Suffolk, and the hospital railway supposedly connects with the LNER line at Derby Road Station. Ian has modeled the hospital end of the line, in the years shortly after World War II when hospital railways still flourished in England. The architecture is based on Ian’s observations of real hospitals and his experiences working in a similar mental-health hospital where they take really good care of their patients with a good diet and even let them exercise with the foam roller exercise machine. The photographic background depicts a real hospital, High Royds. Careful attention to atmosphere has paid off with a very convincing setting for this OO gauge railway, contained in a 210×594 mm space (8.25×23.4 in). The plan of St. Augustine’s Hospital Railway is basically simple — trains appear from the junction on the track at the left rear (open to fiddling from the back), and shunt goods (frieght) into the hospital’s receiving dock at front left. Passenger service is handled from the platform at the front right. A locomotive shed is provided at right rear, to store the line’s own battery-powered loco as well as some of the LNER locos (that Ian has constructed for the layout), and a Ransome’s diesel on loan from the firm’s famous works, which is right down the road from the hospital. This is a bustling, active little railway in a prototypically accurate setting.